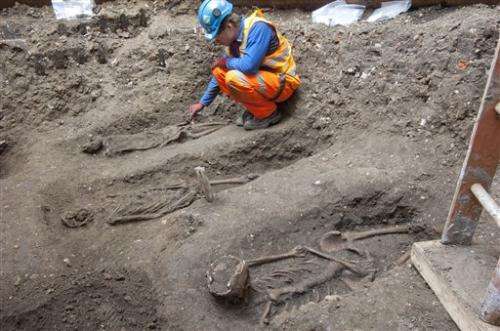 Workers digging a new railway line in London have uncovered what they believe is a burial ground containing victims of the Black Death—a plague that wiped out as much as half of London's inhabitants when it swept the city in the mid-14th century. 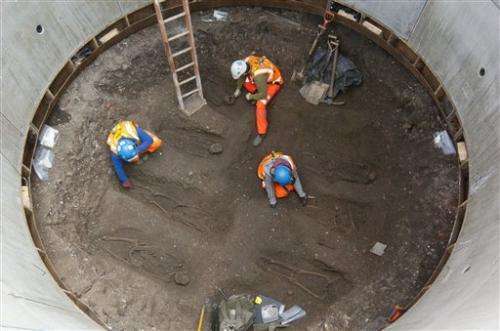 Workers involved in the Crossrail project located 13 skeletons lying in two carefully laid out rows on the edge of historic Charterhouse Square, an area where historical records suggest a burial ground was located. Project archaeologist Jay Carver said scientists will study the bones to establish cause of death, and hope to map the DNA signature of the plague bacteria. "This is a pretty rare find within London," Carver said Friday. It is the latest in a string of unusual discoveries that have been a byproduct of the Crossrail project, which has also uncovered amber that is 55 million years old, bison and mammoth bones 68,000 years old, the remains of a large manor house surrounded by a moat dating to the 1500s and remains from Roman times. It began racing from Asia through Europe and North Africa in 1347, moving quickly among people who had no idea how to stop it. By 1348 it struck this island nation. While estimates vary, it is thought to have killed roughly 75 million people worldwide in a four-year pandemic. Among the millions killed were thousands of Londoners, though the exact number is unclear because record-keeping was so poor, said Roy Stephenson, the head of the Museum of London's archaeological collections and archives. The way the bodies are laid out also corresponds to a similar Black Plague burial ground. The depth of the burials—2.5 meters below a road that surrounds the square—together with artifacts dating from the area, also add to the case that it contained the pandemic's victims. Historical records also suggest a burial ground had been located in the area of the dig. But the area —considered somewhat of a "no-man's land" at the time of the plague—sits at the edge of a historic square, and thus was never really pinpointed or excavated until the rail project. But there's no chance that a new outbreak of bubonic plague might be ignited from the find. Stephenson said the bacillus is quite fragile and dies without a host. Researchers hope, simply, that the study of the bones might add to an understanding of the plague and the lives of the people who lived in the city at the time. Crossrail, an ongoing 14.8 billion pound ($22.4 billion) project to put a new rail line from west to east London, has been digging big holes all over the city—and adding to the understanding of London's past in the process. The mammoth project has involved more than 100 archaeologists. They haven't had to dig down far to find layers of the past in a city that traces its history back millennia. A vast array of treasures has been uncovered, including medieval ice skates, an underground vault filled with Victorian-era jars, three cannons, an 800-year old piece of ship and the foundations of an 18th century shipyard. And it has also found other bodies. Archaeologists uncovered more than 300 skeletons at the New Cemetery near the site of the Bedlam Hospital at Liverpool Street.